Today I'm gossiping about the Boston Public Gardens. As I mentioned on Friday, I had been visiting the Gardens to take a look at the tulips. The tulips are only around for about two weeks and they are absolutely gorgeous. It was crazy how many people were out photographing them. I have been posting some of the photos on Instagram (IG) but I know not everyone is on IG. So, thought I would share them on here as well. Who doesn't love to look at pretty flowers? How gorgeous is the Public Gardens? If my allergies were not an issue, I would sit there for the day. It's a great place to sit (read a book) and people watch as well as take in all the beauty surrounding you. Much thanks to Leeann & Kimberlee for letting me link up. 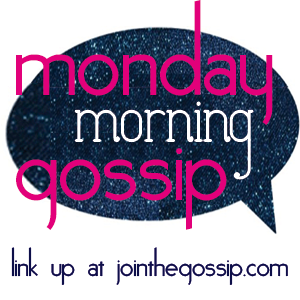 Please check out Leann at Join The Gossip and Kimberlee at I Have A Degree In This. Where do you like to sit and relax?? I just love the public gardens too! My husband proposed on the bridge there!! Ooh that is so awesome!!! It's such a wonderful place. Gorgeous pictures! Love the flowers! Thank you. I too love the flowers!! Oh how lovely! I may head to Long Beach today. So nice that spring is finally here. Hope you made it out to Long Beach. Isn't it great that spring finally arrived? I don't think we could last with anymore cold weather. omgosh gorgeous! the cherry blossoms with the swan peddle boats SOOOO pretty!! i love your bag hon! My bag is C Wonder. Isn't it fab!! It's a great work bag. I do not get to Boston nearly enough! The tulips look amazing! The weather was perfect for being outside too. You have to go see the tulips, they are beautiful. Sadly, they don't stay very long. Tulips are one of my favorite flowers! Looks like such a pretty place to visit. Mine too. It's one of the best places to visit in Boston. Gorgeous photos!! Tulips are my favorite flower and they are beautiful!! Thank you so much. They are one of my favorites as well. What gorgeous pictures!!!! Makes me miss Boston so much!! Thanks! Boston misses you too!! Beautiful photos of the cherry blossoms! Thank you, I was so happy that I was able to get a pretty decent picture of them with my iphone. Absolutely beautiful photos Mree (and thank you for stopping by my blog!) I love coming by and sitting for a bit, my allergies are also out of control this year! Thanks Georgina. Thanks for visiting my blog too!! Mine too. Actually, I have been avoiding the gardens cause my allergies have been out of control. The one downside of this time of year. Soooo beautiful!!!! :) Wish we had some of that here...it's been so hot lately, and dry too, that it is pretty impossible to experience something as beautiful as cherry blossoms and just nice green gardens here in Southern California. They are really beautiful. Oh I do not like the heat, at all. and I really do not like humidity. It's the worst. Yes, we have a few around town!! Thank you for the link up, it's so much fun. Gorgeous! I definitely need to visit the gardens in NYC. Still never been to the Brooklyn Botanical Garden. Kimberlee, I have never been to that garden either but I hear it is amazing. so yes, you are in boston! awesome. i'm loving all the tulips but reallllly loving the lilacs. my favorite flower ever!